All transactions are safe and secure with a reliable history in online purchasing behind each of our associates. Buy the UC Santa Cruz Banana Slugs t-shirt to own Pulp Fiction clothing and merchandise. 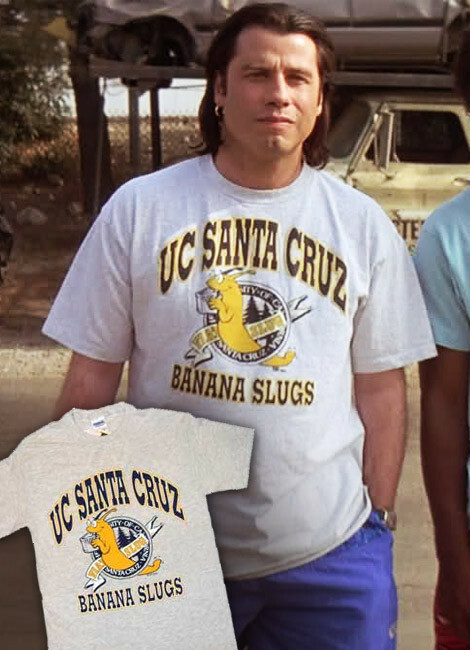 This might not be the usual attire for Vincent Vega but after being sprayed down with a hose, this UC Santa Cruz Banana Slugs t-shirt is the one Jimmie throws him. You can't be picky when it comes to escaping the law. Not only is this tee designed for sports fans and Pulp Fiction movie addicts but works well as a costume too! So slick your hair back like John Travolta and enjoy the ride. In addition to the UC Santa Cruz Banana Slugs tee above, browse the Pulp Fiction Clothing Gallery for more apparel like men's and women's clothes, kids shirts or hoodies.